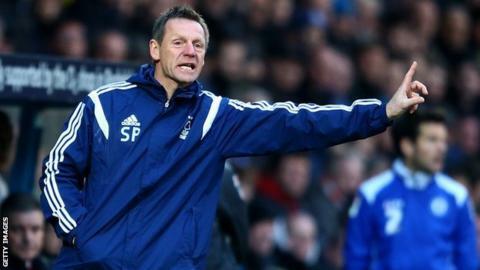 Nottingham Forest manager Stuart Pearce says he has the "skin of a rhino" and is unfazed by rumours he will be sacked if results do not improve quickly. Pearce led Forest to the top of the Championship table after seven games, but they have slipped to 11th and 17 points adrift of leaders Bournemouth. "Football management is full of speculation and pressure. If you don't win games you get criticised," he said. "It's not a worry - it's irrelevant. I have the skin of the rhino." Pearce, 52, spent 12 years with Forest as a player and a short time as caretaker manager, and was a hugely popular appointment when he took over as boss in the summer. But after some impressive early-season results, they have won just twice in the league since beating Fulham in September and were knocked out of the FA Cup by League One side Rochdale on Saturday. However, Pearce remains confident he has the backing of the dressing room and chairman Fawaz Al Hasawi. "There has always been faith from above," Pearce said. "Results have not been good enough recently but I am here for the long haul and want to improve them. "We are working hard to rectify things. I have never been one of these boom-and-bust people. I prefer to be consistent. "You learn a lot about people around you when things are not going well - more than when things are going well." Forest host Sheffield Wednesday on Saturday before an East Midlands derby at Derby the following weekend. "I always feel pressure at this football club because it means a lot to me," Pearce added. "I hurt for the supporters if we don't win. They know I care and show a great deal of loyalty to me. "We started extremely well and I threw cold water on that and said 'let's calm down a little bit'. And the same has to happen when you are on a bad run. "I will stand up and be counted when things are not going well. At this moment in time you will always see my face."